Used 2015 Dodge 3500 Sold in Houston TX 77063 Everest Motors Inc. PLEASE CALL ONE OF OUR SALES ASSOCIATES AT (281) 888-2872 FOR PERSONAL ASSISTANCE AND TO GET MORE INFORMATION ABOUT THIS VEHICLE. WE ARE LOCATED AT 3230 JEANETTA ST HOUSTON TX 77067 ALL OUR VEHICLES ARE UNTOUCHED BY RECENT HURRICANE WE GUARANTEE NO FLOOD OR ANY STORIES BEHIND OUR VEHICLES! 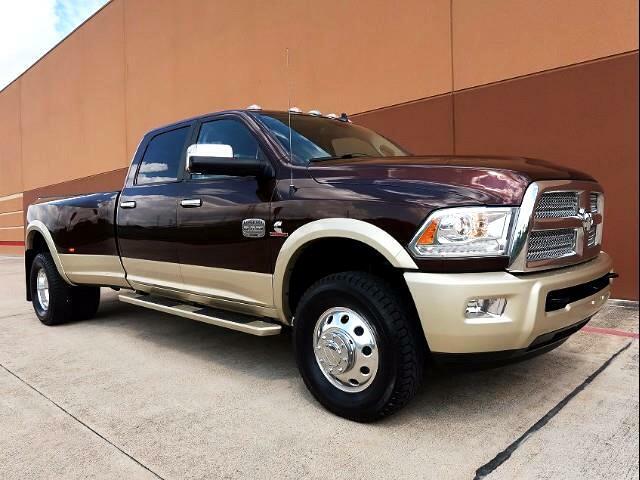 !You are Looking at a very powerful	One Owner	Great Condition Texan Rust Free and Loaded	2015 Dodge RAM 3500	4X4 Laramie	LONGHORN	Crew Cab Dually	6.7L Diesel	Long Bed. This powerful Dodge with all the standard equipment and much more: 6-Speed Automatic Transmission 6.7L L6 Cummins Diesel Engine Air Conditioning 3 73 Rear Axle Ratio Limited Slip Differential 4X4 Package Laramie LONGHORN Package Bluetooth Dual Climate Control Second Row Folding Seats Clearance Lights Cruise Control Center Console Navigation System Power Moonroof Back Up Camera Premium AM/FM/XM DVD Player W/MP3-WMA-JPEG W/HDD W/Audio Steering wheel Control Pop-Up Gooseneck (Done Right) Fender Flares Adjustable Power Pedals	Auxiliary Audio input W/USB Alpine Sound System	Traction Control Park Distance Control Power Rear Sliding Window Remote Vehicle Start Factory Brake Controller Heavy Duty Engine Cooling Exhaust brake Electric Shift-on-the-Fly Part-Time Transfer Case Driver Memory Seat Heated Steering Wheel Power Door Locks Front Power Seats Premium 17 Inch Wheels Garage Door Opener 115V Power Outlet Heated & Cooling Front Seats Intermittent Wipers	Heated Rear Seats Power Windows Storage Tray Power Chrome Heated Trailer Towing Mirrors Fog Lights Dual Air bags Tilt Steering Wheel Running Boards	Tinted Glass Spray On Bedliner 4 Wheel Drive Six Matching LT285/70R17 Tires in Great Shape and Much More... This beautiful One Owner 4X4 sharp looking loaded hard to find and very powerful truck is in Great condition inside and out with 6.7L Cummins Turbo Diesel engine paired only with the tough Automatic transmission. Best-in-class available torque So you can tow a train with this truck!!! These trucks have the most towing capacity. Engine Runs super strong with absolutely no smoke or blow by!!! There is no fluid leak at all! Underneath this truck is dry and clean. This 4X4	truck runs and drives Great! All the power equipment and gauges operate perfect! exterior color is in Great condition with no major ding dent or scratches However you might find a few super minor scratches here and there. truck looks super sharp! Interior as shown in the pictures is in Great condition. All the panels are in Great condition with no sign of abuse. Leather Seats are very clean with no tear crack or wear. Headliner dash board door panels are specially clean! Six Matching LT285/70R17 Tires in Great Shape. This nice truck comes with Two Combo Key/Remotes Books and Manual!!! All our vehicles are sold AS IS and with no warranty. Message: Thought you might be interested in this 2015 Dodge 3500.